The latency-free Cue Mix signal for the musician can be composed of the musician’s track and the track mix. 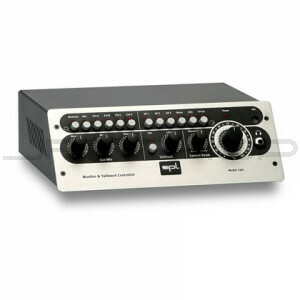 The Talkback communications option via built-in microphone provides a footswitch input for remote control and a separate output with the dry talkback signal. These features mean that monitoring in any DAW-based studio now can be expanded to include the kind of essential functionality that to now has only been available in large analog consoles. The sleek, ergonomic construction makes the MTC perfect for desktop placement – for example, near or under computer screens.